This activity introduces participants to the Don’t Laugh at Me song and explores how and why it is the theme song for the “Expressing Feelings” theme and the cornerstone for the Operation Respect project. Operation Respect started with a song called Don’t Laugh at Me written by Steven Seskin and Alan Shamblin. This song has traveled throughout the world. It has been translated into many languages and been sung by millions. We believe it is an anthem for creating respectful, safe, compassionate environments for children. The founder of Operation Respect, Peter Yarrow of Peter, Paul & Mary, first heard this song when his daughter, Bethany, brought it to him at a folk music festival in Kerrville Texas, and when he heard it, he was moved to tears. Peter then brought it to Paul & Mary—with whom he had sung for 37 years. Peter, Paul and Mary were known for singing songs that touched the hearts of the people listening to them. Early in their career, they sang “Blowing in the Wind” and “If I Had a Hammer” at the 1963 Civil Rights March in Washington D.C where Martin Luther King, Jr. gave his famous “I Have a Dream” speech. They decided to add “Don’t Laugh at Me” to their repertoire and in one of their first on stage performances they sang it for 6,000 school principals at an educational conference where they were given a long, standing ovation. After the concert, a number of principals approached Peter and told him that they needed that song in their schools because they said, “What the song says is what we want to teach our children.” Peter said that he would make sure that they would have the song in their schools, but that he was even going farther. 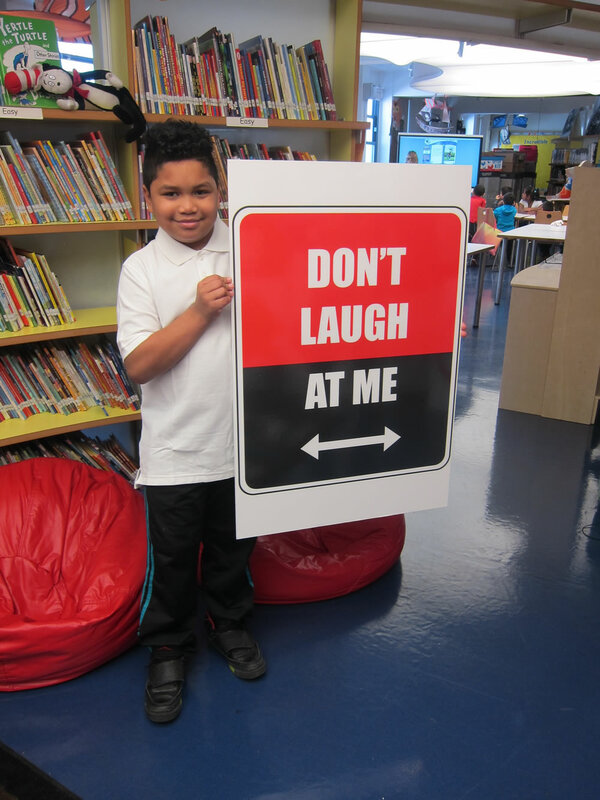 He was working with Educators for Social Responsibility (ESR) to create resources to go along with the song and Operation Respect and our Don’t Laugh at Me materials are the result. We believe that music reaches peoples’ hearts and that when people open their hearts, they can become closer to each other, create a caring community and treat each other with kindness and respect. Children and adults alike remember the way they were touched when they heard certain songs, how the lyrics and melody together made them feel and these memories of some special songs last a lifetime. Musically, the “Don’t Laugh at Me” song is the centerpiece of our Operation Respect efforts in schools, summer camps and elsewhere, and it is the “theme song” for our Feelings unit, the first of four cornerstone themes in our curriculum. We hope that you’ll sing this song frequently enough so that you’ll know the words by heart and that you’ll return to this song often, as you do the work of this program, to find the inspiration that will help you to work together to create safe, caring and respectful classrooms, schools and communities for yourselves and for all of us. Brightly colored card stock or construction paper, glitter glue, scissors, and a variety of buttons, pompoms, feathers or other decorative art items. Welcome the students and introduce this quick Word Whip activity. Go around the room and ask each student to contribute a word that comes to mind when they hear the word “school.” Go around the room a couple of times. Chart the words as the students go. “I’m going to play the song again and this time I’d like you to be aware of the feelings and thoughts you are having as you listen to it. How many of you thought that this song was sad? Please raise your hands. How many of you thought that this song was happy? Please raise your hands. How many of you thought this song was both happy and sad? Please raise your hands. Ask: Who is right? Is this song happy or sad? What were some of the lyrics in the song that made you feel happy? What lyrics made you feel sad? Did you have other feelings while listening? What were they and what were the lyrics at that time? Summarize the points made by the participants. Now show the video of “Don’t Laugh at Me”. “How was watching the video different than just listening to the song? Did you have any different feelings while you watched? When? How do you think the people in the song and the video want to feel? What actions by others could help them feel that way? Now have students identify one feeling they would like to have in the classroom. Have students draw an outline on brightly colored card stock or construction paper around each of their hands and cut them out. Students should write their names on one hand and a word for a feeling that he or she would like to feel in this classroom on the other hand. Decorate the hands with glitter glue and buttons or pompoms, feathers, etc. and post around the classroom. Do a go round of one commitment each student can make to help others have the feelings they want in the classroom. Be sure to include your own. K – 1: For the main activity give each student two index cards. Have them draw a smiley face on one and a sad face on the other. Have students hold up the cards instead of raising their right or left hands to show how they feel listening to the song. For the Integrated Arts activity, students may need a little help tracing their own hands. Pair students to help one another. Or, as an alternative, have students trace their hands, but rather than cut them out, simply have them decorate the paper surrounding their hands. Display projects so they surround the chart with hands touching, if possible. The hands can be a couple of inches away from the chart, making a circle or a larger rectangle. 6-12 and Adult: Give five index cards to each person. The second time students listen to the song or watch the video have them record feelings they think the people featured in the song are having –one feeling per card. When they are finished, collect all the cards and hand them randomly back out (5 per student). If it’s a difficult feeling, have students write on the back of each card something nice they could say to someone having that feeling to help him or her feel better. If it’s a positive feeling on the card, what might they say to that person to help them continue to feel good? Integrated Arts: Instead of Hands Across the Classroom, have students individually or in small groups write poetry, a rap, song lyrics, etc. that are inspired from the Don’t Laugh at Me song. Share these creations widely or use them as anthems for your program as it develops. K-1 Literacy: Read Chrysanthemum by Kevin Henkes. This story shows how the things people say to one another have real effects. Because of the teasing, Chrysanthemum doesn’t want to go to school, which is what happens to children when they are teased, excluded, or bullied. Ask students to notice how Chrysanthemum feels about her name at the beginning, middle and end of the story. Ask students to evaluate the adults’ response to how the other children are treating Chrysanthemum. If they were in Chrysanthemum’s shoes, how would they want adults to respond? Have students create a tri-fold out of construction paper. Students can draw and/or write what’s happening in the story at the beginning, middle, and end, focusing on how Chrysanthemum is feeling. 2-5 Literacy: Read Chrysanthemum by Kevin Henkes. Have students imagine they are in Chrysanthemum’s class and have been a witness to the way Chrysanthemum is being treated. Have them write a letter to one of the students who is teasing Chrysanthemum, expressing their thoughts and feelings about the student’s actions. What would they like to see happen differently? K-5 Literacy and Arts: Read Stand Tall, Molly Lou Mellon by Patty Lovell. Discuss with students the way Molly Lou feels about her “shortcomings.” Have students choose one of the sayings Molly Lou’s grandmother shares with her to help her face problems. Choosing from a variety of art materials (watercolors, pastels, crayons, markers, etc. ), have students illustrate what that saying means to them. Have them include the saying in writing as part of their design. Here is a link to Stand Tall, Molly Lou Mellon being read aloud. 6-12 English and Media Arts: Have students record PSAs to be read over the PA system of your school to end bullying and disrespect. 6-12 English and Music: Show students the Baby Jay version of the Don’t Laugh at Me song. Have them create their own version of the song or have them simply write rap lyrics that relate to your school. 6-12 Integrated Arts: Expand your Self-Portrait project to all classrooms and decorate your halls with feelings words that reflect how everyone would like to feel in your school.